The Department of Punjabi at Punjabi University has planned a three day conference on the Punjabi Diaspora on January 20-22, 2015. This will be a third such gathering of scholars with the main theme of this seminar will be an exploration of the Punjabi Diaspora’s interaction with host societies. The last two conferences were devoted to [a] Punjabi Diasporas’ linkage with Punjab as its ‘homeland’ [b] The first conference had a general theme while trying to map various aspects of the Punjabi Diaspora. This third conference, like the previous two, will be spread over three days. Scholars are invited to contribute on any of the topics falling under the main theme of the Punjabi Diaspora’s interaction with host societies which is elaborated below. Lakhvir Singh, Chairman, Punjabi Department. The conference will be a two day event of panel discussions, and will be held at the newly-built Interdisciplinary Building (Symposium INTS 1113) of the Riverside Campus of the University of California. The abstracts of the papers are due by December 15, 2014 and complete papers by April 15, 2015. Attendance at the seminar will be open to graduate students, faculty and the public. The Punjabi University is holding a major three-day conference on the Punjabi Diaspora at its campus on February 3-5, 2014. Organised by the Punjabi Department, the main focus of the conference is an exploration of multiple connections of the Punjabi Diaspora to its land of origins, starting from the late nineteenth century to the present era. While the new technology, especially internet has helped to make the relationship of global Diasporas and their lands of origins, lively, complex and more intense, the study of the multidimensional exchange between the Punjabi Diaspora and its homeland presents severe challenges and issues. In the case of overseas Sikhs, as several scholarly studies have underlined, there has been a close linkages from the late nineteenth century to the present; this became especially problematic in the 1980s after the traumatic events in the Indian Punjab. A fierce debate ensued on the issue of Sikh minority in India and continues to draw attention of a large part of the Sikh Diaspora – which constitutes a major section of Punjabis abroad. This immediately alerts us to the question: what about the Punjabi Hindus and other smaller sections of the Punjabi Diaspora, how they relate to the land of their origins; and what about Muslim Punjabis from West Punjab in Pakistan? This is just one dimension of the set of questions that await thorough analysis by experts. We also know how the Punjabi Diaspora has enriched the Punjab economy [both in India and Pakistan], through remittances and contributed to social capital by several philanthropic projects. The Punjabi Diaspora is also a major site of Punjabi creative literature –what are its salient features? How does the Punjabi Diaspora relate to host societies through its imagined word-maps? Then there is related question of Punjabi language –how does the Punjabi Diaspora maintain its home language and impart to its new generations? How does it draw upon the land of origins in such an endeavour? Similar questions arise as far the reproduction issues of various religious traditions among the Punjabi Diaspora. Thus, besides welcoming papers addressed to fundamental theoretical question of the idea of ‘homeland,’ among the Punjabi Diaspora, contributors are encouraged to explore multi-dimensional ways overseas Punjabi communities relate to the land of their origins; Papers on any aspect of such connections through economic, cultural, religious and political linkages are welcome as also exploration of the kind of debates among the Punjabi Diaspora through the media as it has undergone vast change from earlier newspapers exchanges to extensive discussions via websites and cyberspace. The University will provide usual facilities for contributors, free board and lodging including travel assistance up to Patiala campus for all participants from other states of India, and in the case of foreign participants’ return fare for railway passage from New Delhi airport to Patiala. 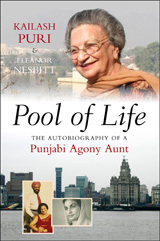 Eleanor Nesbitt’s introduction contextualises the life of Kailash Puri, Punjabi author and agony aunt, providing the story of the book itself and connecting the narrative to the history of the Punjabi diaspora and themes in Sikh Studies. She suggests that representation of the stereotypical South Asian woman as victim needs to give way to a nuanced recognition of agency, multiple voices and a differentiated experience. … The narrative presents sixty years of Kailash’s life. Her memories of childhood in West Punjab evoke rural customs and religious practices consistent with recent scholarship on ‘Punjabi religion’ rather than with the currently dominant Sikh discourse of a religion sharply distinguished from Hindu society. Her marriage, as a shy 15-year-old, with no knowledge of English, to a scientist, Gopal Puri, brought ever-widening horizons as husband and wife moved from India to London, and later to West Africa, before returning to the UK in 1966. This life experience, and Gopal’s constant encouragement, brought confidence to write and publish numerous stories and articles. … Kailash writes of the contrasting experiences of life as an Indian in the UK of the 1940s and the 1960s. She points up differences between her own outlook and the life-world of the post-war community of Sikhs from East Punjab now living in the West. In their distress and dilemmas many people consulted Kailash for assistance, and the descriptive narrative of her responses and advice and increasingly public profile provides insight into Sikhs’ experience in their adopted country. In later years, as grandparents and established citizens of Liverpool, Kailash and Gopal revisited their ancestral home, now in Pakistan – a reflective and moving experience. The book includes a glossary of Punjabi words and suggestions for further reading.